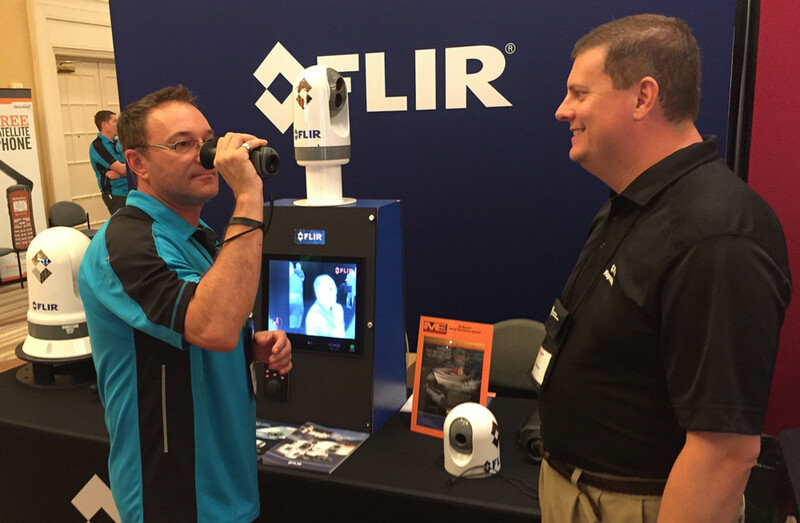 Jesse Revilla (left), account manager for Global Ocean Security Technologies (GOST), checks out FLIR’s Ocean Scout TK thermal imaging camera with the assistance of Jim McGowan, FLIR Maritime of the Americas marketing manager, at the NMEA’s International Marine Electronics Conference & Expo in Naples, Fla.
NAPLES, Fla. — The National Marine Electronics Association’s 2016 International Marine Electronics Conference & Expo held here this week drew a record 450 attendees with 50 exhibits, in-water boat demos and dozens of educational sessions. Held at the Naples Grande Beach Resort, the event began Tuesday and wraps up today. All exhibitors are marine electronics manufacturers. The show is held every other year in a Florida location, and on the west or east coast (in a variety of locations) during non-Florida years to “better serve the NMEA members in those areas,” said Reedenauer. A record 450 conferees attended the event. The show gives dealers, distributors, installers and technicians face time with manufacturers. The NMEA has more than 650 members. Next year’s conference and expo will be held in Bellevue, Wash. The 2012 show in Orlando drew 425 attendees. The event has consistently strengthened since the Great Recession, particularly since 2011, when the association began holding education sessions. Those sessions, which cover both technical and business aspects of the trade, really ramped up in 2012, said Reedenauer. “Now the sessions account for about 50 percent of the show,” he said. Twelve sessions were held each day, covering everything from digital switching to insurance to autopilot installations. And manufacturers held their own training sessions. Several manufacturers brought demo boats with their installed electronics. 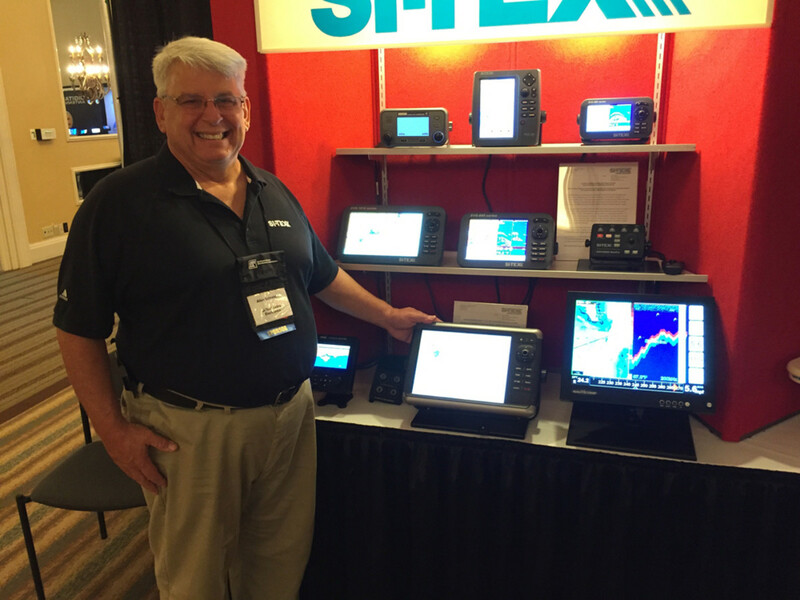 Allen Schneider, senior vice president for Si-Tex Marine Electronics, said Si-Tex, like many other manufacturers, offers its own technical training session at the NMEA event. Si-Tex brought five company employees to the show. They take advantage of the education sessions themselves. This is the first year that the NMEA has coordinated with the American Boat and Yacht Council to hold education sessions for certification. The ABYC held its marine electrical certification course and the NMEA offered four different installer-training sessions. I walked the floor Wednesday for a couple of hours. Exhibitors were hyped up, touting the strengths of the event. 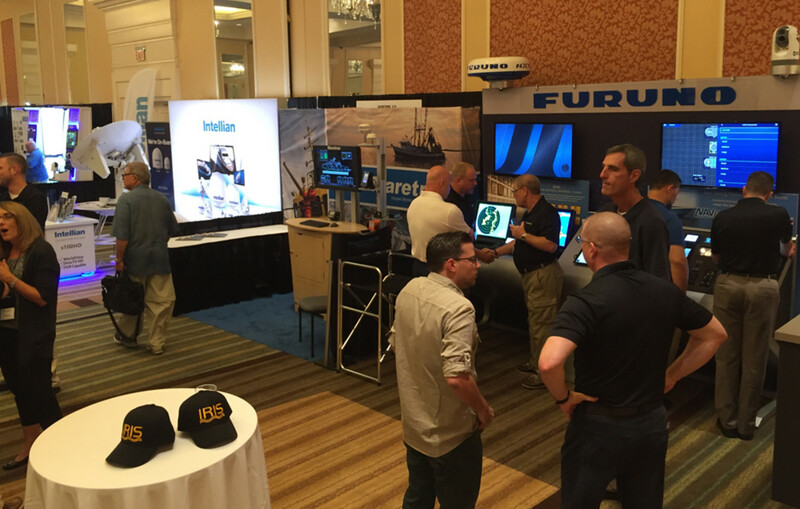 “It’s one of our best opportunities to get together and network — to see what our collaboration technology partners are doing with us and also a chance to check out the competition,” Furuno national sales manager Matthew Wood said. Matthew Wood, Furuno national sales manager, has noticed an increase in the educational offerings at the show. He attended three seminars on Wednesday, including digital switching and coastal surveillance. Allen Schneider, senior vice president for Si-Tex Marine Electronics, said the NMEA event is ideal for showing the marine electronics distributors Si-Tex’s new product under development. Humminbird has historically built its business in the freshwater market. 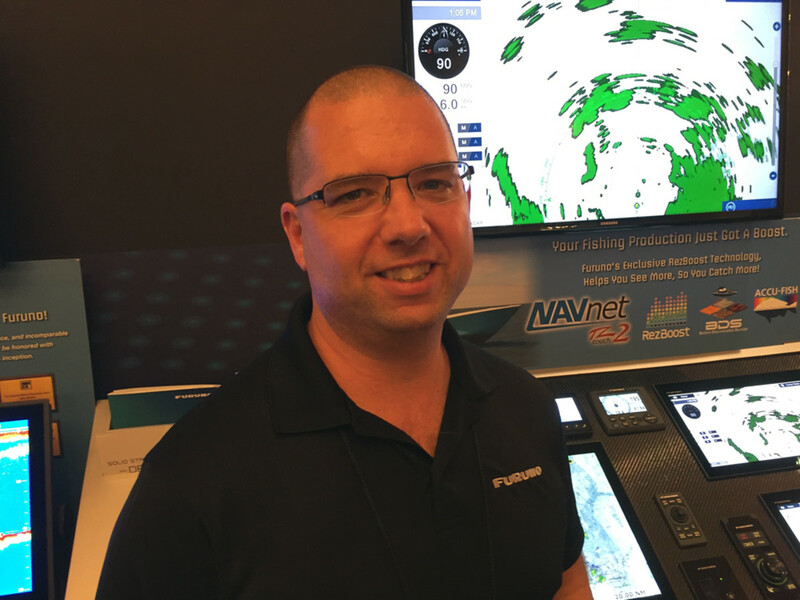 The NMEA show gives the company the chance to make distributors and dealers aware that it offers a complete line of electronics for the saltwater market, said Jeff Davison, senior director of product development. “We would not normally put these on display right now at a retail or public show,” Schneider said, pointing to the display screens of three new products from the company, including a new AIS (Automated Identification System) unit. 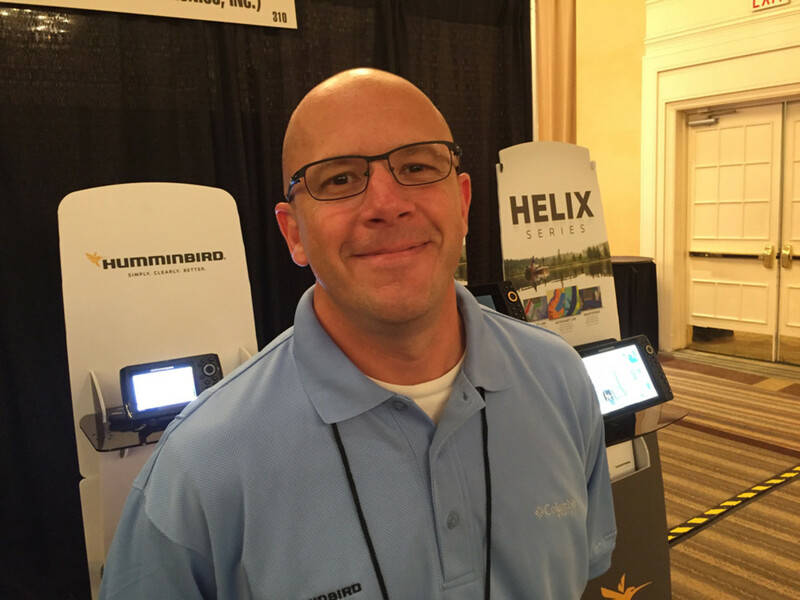 Jeff Davison, Humminbird senior director of product development, came to the show partly to grow the company’s saltwater market share. Humminbird has over the years made its mark in the freshwater market and has been a leader in sonar innovation, he said. Tom Fischer, who has owned the boat brokerage company Fischer Marine Boat and Yacht Sales since 1989, said the NMEA show is a good place to size up — in one location — the full gamut of electronics equipment and technology. 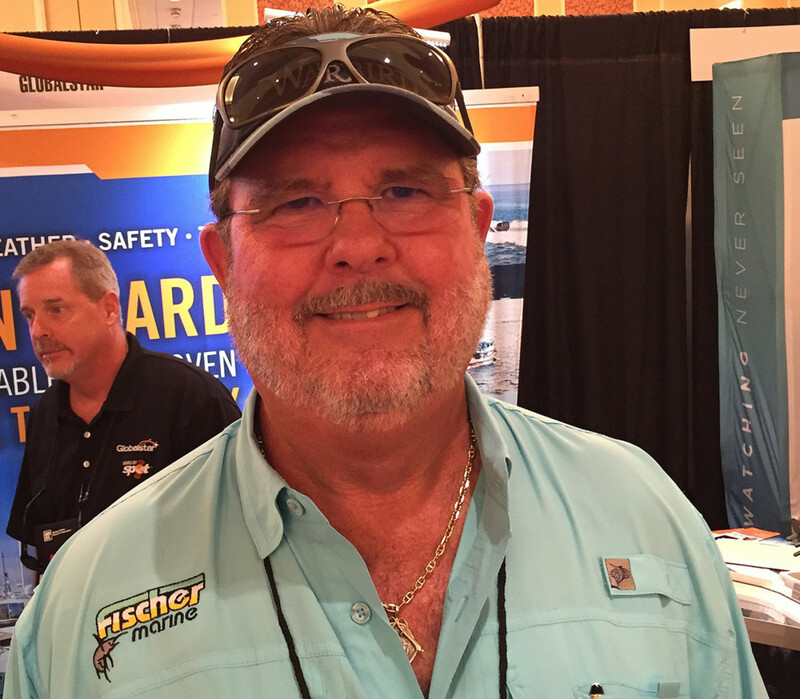 Tom Fischer, owner of Fischer Marine Boat and Yacht Sales, came to the show to research security systems. He plans to offer them to his customers as an option. Fischer also likes to educate his customers about boater safety, so he was checking out the personal locator beacons on display at the show. The show was sponsored by about 20 companies, including major sponsors Simrad, Garmin, Gemeco, Great American Insurance Group, Nauticomp, FLIR/Raymarine, Bonnier, CWR Electronics and Soundings Trade Only.